Like many caring Malaysians, you may wonder at times if you or your organization could play a role in helping our government shape our students into confident and well-informed knowledge workers of tomorrow. Improving education is everyone’s business. The New Straits Times English Development Programme welcomes the involvement of individuals or corporate citizens as our Partners in Education. This programme is one of the ways you can help the young Malaysians towards a holistic education. EDP is our genuine effort to bridge the urban-rural divide in English education. We provide students and teachers with the ‘living textbook’...the daily newspapers. This program includes the English Language workshop for students and teachers, special English test, quarterly newsletter and essay writing competition. Having access to EDP will not only help reinforced the curriculum, but will give students the opportunity to become more aware of and involved in the community and world around them. This aspiration would be hard to realise without the support of sponsors. There are many schools interested in the Newspaper in Education concept but many students especially those in outlying areas can hardly afford to buy newspapers for classroom use. 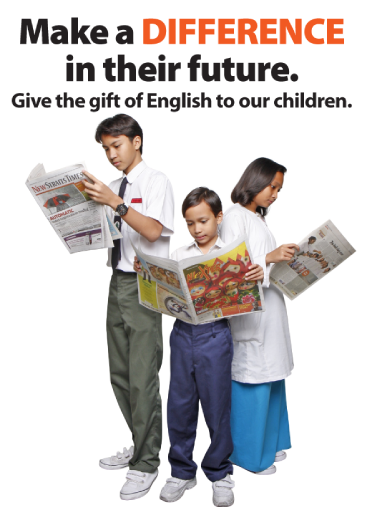 This is a no-risk investment: for a relatively small investment, your organization will be able to sponsor New Straits Times (complete with educational supplements) for the benefit of any schools in Malaysia of your choice. The distribution mechanics can be customized to suit the reading needs of your sponsored schools. Should you need further information on this programme, please call Mr Rajan and Ms. Jaja (1-800-88-5604 or 03-20569537).